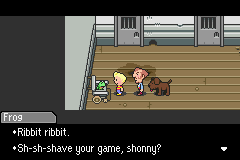 MOTHER 3 Fan Translation » Blog Archive » MOTHER 3 English Translation 1.1 Released! 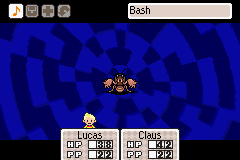 MOTHER 3 English Translation 1.1 Released! 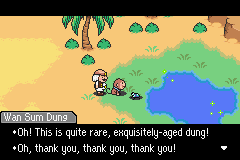 After lots of work trying to get a lot of the old gang back together and after lots of testing and bug reports courtesy of helpful fans, version 1.1 of the English MOTHER 3 fan translation is out! You can get it here. 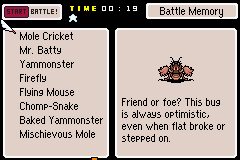 The new patch fixes all known typos and most (though not all) of the bugs encountered in version 1.0. 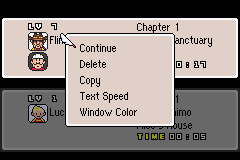 Save files from the 1.0 translation ARE compatible with the new patch, so no worries there. Save states from version 1.0 should probably work with version 1.1 most of the time, but there’s always a very slight possibility that one might go crazy. Regular saves are the way to go. Many of them are making great progress, so keep your eyes on those sites for some international MOTHER-loving! 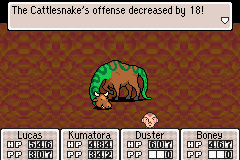 While I’m at it, I should mention that the free online version of the MOTHER 3 Handbook was released a week or two ago, and you can see it here. It’s very informative, funny, and full of awesome art and funky freshness. So check it out! Well, that’s all for now. Mato out! Posted on Monday, July 20th, 2009 at 4:33 pm by Mato, filed under Uncategorized. You can follow any responses to this entry through the RSS 2.0 feed. Comments and pings are currently closed. Im definitely looking forward to that German one. Thank you so much for all the work you put into this Mato, Have a drink on me the next time you go clubbing. Thanks for the update Mato! Too bad I can’t get my save to transfer over on my Supercard. 🙁 I was only half way through, I guess I could start over though.. I totally understand that you do no longer want to see the effing code after all this time. Will you finish the translation-notes? 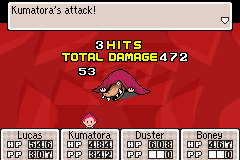 Yeah, I still plan to, but a few other things are higher priority right now, like Mother 1+2 and probably my Mother 2 vs. EarthBound site, among my other projects. I’ve waited MONTHS for this! 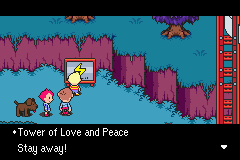 Now, we need to get crackin’ on that Mother 1+2 translation! 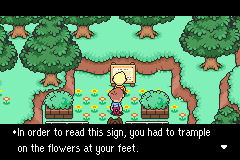 Has Jeffman said ANYTHING on wanting to Translate the Mother 2 portion of it? Or is that part of the project still up in air??? 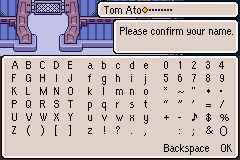 Mato: you could always put out a call for someone to pawn the code off to. As someone said, “the final responsibility of someone running an open source project is to find a worthy successor”. Whil ethe situaition is different and the source is not highly open, the rest applies. I’d volunteer except I’m really really busy. when things calm down I might just do it. Renegade X: He’s busy but I know he wants to work on it. He’s been tinkering with it on and off but nothing serious so far. Your commitment to making the translation more than excellent still astounds me. I’ll be sure to use this next time I have the time to drop some hours into an RPG. I signed up on this blog to express how wonderful it is to have found this site. You guys have done a great service to us all, and I hope that Nintendo finds you, and gives you the highest paying translation jobs in the world. 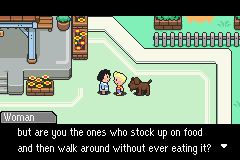 I can’t wait to get my copy of the Mother 3 Handbook in the mail, and I am looking on eBay for an official cartridge, but I am baffled that you don’t have a PayPal donation button. Anyway, thanks for having the coolest thing online EVER!!! 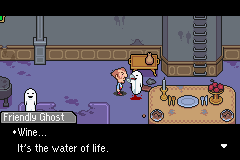 You are like the best translator ever mate; being able to include all these Itoi’s humor and in-game jokes with the way he would express them if this was his’ and then of course the game itself! 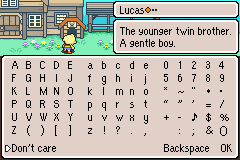 And well LockNESS, I think Nintendo surely knows about him, but somehow backed off from making any comment about it. Will there be an official changelog? I wonder how many/what bugs you guys squashed in the 1.1 update. 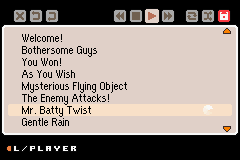 Compared to the commercially available games I’ve played, I didn’t even notice any typos or bugs. You folks did a damn fine job and your dedication shows. I can’t fathom why Nintendo hasn’t tried to pick your work up for a commercial release. 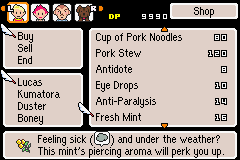 I know I’D pay them for an official English cart. well… im just dropping by again to remind you that i love you. Thank you so much for taking your time to do this great job of a translation, guys. I couldn’t resist the temptation of buying the handbook too, and it’s awesome as well. 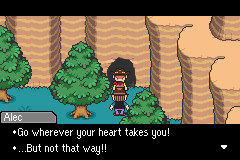 When you are in Aeolia’s house, the needle gets pulled and then she starts a little speech, but the game actually thinks Ionia’s the one talking. 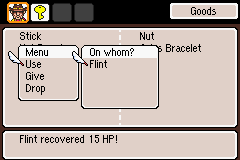 Just a minor detail that may bug some people, but other than that, I feel like I’m playing a fabulous game with the best script ever. 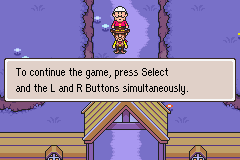 does this work if you are emulating on xbox? 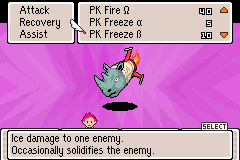 i’m using an xbox port of visual boy advance. God, I remember coming to this website in five minute intervals 24/7. This this was so exciting. But now it is a relic long forgotten. May I help with the Latin American Spanish translation? We're not affiliated with Nintendo. 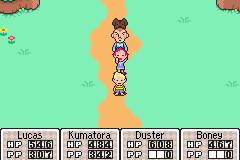 MOTHER 3 is the sequel to MOTHER 2 (also called EarthBound). 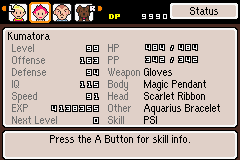 It is a GBA RPG that was released in Japan in April 2006. Nintendo has made it clear that they do not intend to translate the game, so we, the fans, have begun our own translation. When will the translation be done? It is done. See here.